As movements to destigmatize mental health issues gain ground and increased insurance coverage makes healthcare services more accessible, more people are comfortable seeking counseling. Mental health counselors help others understand and cope with stresses or disorders, either directly by conducting counseling sessions, or indirectly through research and education. Read on to learn more about online mental health counseling degree programs and the careers to which they can lead. Completing an online degree program in mental health counseling is an important first step to achieving a career in the counseling field. Students will progress through a curriculum designed to develop skills in aiding individuals suffering from stress and mental disorders, all in a convenient online format that makes learning as accessible as possible. We’ve looked into the programs offered around the country and put together a ranked list, basing our findings on factors such as overall tuition cost, class size, and available student services. 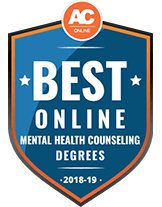 Check below to find our list of the best online mental health counseling programs for 2018-19. Oregon Institute of Technology offers a fully online, 4-year bachelor's degree in applied psychology, with areas of concentration in education, health, counseling and business. Advisers help students tailor electives to their interests and career goals, and required externships - which often can be completed near the student's home - expose them to possible future careers such as mental health technicians, behavior analysts, probation officers, teachers, career or school counselors, or human resources professionals. Graduate school is another option. Also required for graduation are a capstone course, at least 45 credits taken at OIT, and a C average or better in major courses. The 100% online BS degree in rehabilitation studies at the University of North Texas is a great choice for students wanting to enter the mental health field in places such as addiction treatment facilities, mental health centers, veterans affairs offices and community agencies. This program can also be ideal for those planning to continue to graduate school and eventual licensure in mental health counseling. To graduate, students must complete 120 credit hours, including a 1-semester practicum with a human services agency. With a few additional credits, students can add a specialization, certificate or minor to their degree. The fully online, 4-year BS in counseling psychology at Toccoa Falls College can be paired with a counseling, family studies or psychology minor, and can be an ideal option for students planning a career in areas such as human services, business, education or ministry counseling. Students can also continue to graduate school for professional licensing. Examples of upper-level courses include Bible and theology classes combined with major courses. Internship, research, service and outreach requirements will need to be completed prior to graduation. Students seeking online mental health-related bachelor's degrees at Clarks Summit University (CSU) can choose from counseling ministries or addiction counseling programs. Both options provide a biblical approach to psychology and counseling and are geared toward students planning a career in church counseling or addiction counseling along with those wanting to advance in a ministry career. Of the 121 necessary to graduate, 18 can be used towards a CSU online master's in counseling, which can lead to professional state licensure. The bachelor's degrees are 4-year programs; however, up to 90 previously earned credits can be transferred in to shorten the length considerably. Hobe Sound Bible College is accredited by the Association for Biblical Higher Education (ABHE) and offers a fully online BA in counseling degree. The program typically takes 4 years, and consists of 129 credit hours, with credits required in general education, the Bible and major and minor credits. An internship is also required for graduation. Courses are in 7-week blocks, with assignments due at the end of each week. This degree can lead to Biblical Counselor or Pastoral Counselor board certification, while providing a foundation for those planning on graduate work and licensure in professional counseling. Students interested in earning an online bachelor's degree in mental health counseling can choose between Crown College's BS degrees in psychology/counseling and alcohol and drug counseling (ADC) . Both programs are 100% online, 4-years and asynchronous , with a required internship prior to graduation for the ADC program if state licensure is desired. Graduates of the psychology/counseling program have gone on to work in areas such as human services, human resources, public relations and parachurch ministries, or continued on to graduate school. A master's in counseling is also available online at Crown. Faulkner University is a private Church of Christ-affiliated school located in Montgomery, Alabama. Faulkner's online Bachelor of Science in counseling psychology is a hybrid degree program that requires completion of 121 credit hours, including 71 credit hours in the field. All coursework is offered online in an asynchronous format, allowing students to complete their degrees in less than 4 years, if they prefer. In addition, the student must complete an online capstone project and internship at an approved facility near their home. This degree helps prepare students for careers in counseling, human services, psychology and some areas of ministry, and is a good choice for those interested in continuing on to graduate programs in counseling or marriage and family therapy. The University of Maine at Machias' online Bachelor of Arts in psychology and community studies is a hybrid degree program that combines online coursework with field work and internship participation in the student's hometown. Students must also complete a senior capstone project developed with community partners of their choosing. The degree offers 2 concentration areas: disabilities in youth and applied psychology. Examples of recent job titles for graduates with this degree include caseworker, developmental therapist, program coordinator, child protective social worker, behavioral health professional and crisis counselor. Mental health-related undergraduate degrees at Southern Assemblies of God University (SAGU) include a pre-professional bachelor's degree in counseling, which is a good fit for those planning to pursue professional licensure through graduate work. The school also offers a bachelor's degree in human services, which has concentrations in counseling, psychology, social work and criminal justice. Graduates often work in areas such as church ministries, government agencies, nonprofit groups and mental health clinics. All are 100% online, 4-year programs, with 126 credits required for graduation. Approved transfer credits and credits for life experience are accepted for this degree, and online students may be eligible for a 15% tuition grant. John Wesley University offers a fully online bachelor's degree in Christian ministry, with an emphasis in counseling. This 4-year degree serves as preparation for various careers in social services and can also go towards a master's degree for those planning to become a licensed counselor. In addition to 120 credits, students will participate in an internship and community service prior to graduation. Students can transfer in up to 90 credits, and can may also earn credit for military and professional training, life experience and CLEP testing. Torn between a desire to help people and a passion for studying the science of the brain, one researcher found the perfect combination with a career in mental health counseling. Partners with national clinic to create dementia outreach program. Most positions in mental health counseling require advanced degrees, which can mean large time investments. Earning a mental health counseling degree online helps ease that burden by providing students with the flexibility to earn their master’s degrees, post-master’s certificates and doctorates when and where it’s convenient for them. This is ideal for practicing counselors who see clients during the day; who don’t live near an institution with a mental health counseling program that suits their needs; or who have other obligations that require a flexible education schedule. Online mental health counseling degree programs may also appeal to students who want to meet the licensure requirements of a state other than the one in which they live, as many programs are built around local licensure needs. 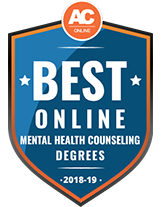 Accredited mental health counseling degree programs offered online often follow the same curricula as on-campus programs, so online students receive the same education as their peers who attend in person, but with added convenience. Students use various learning tools and platforms to access course materials, complete assignments and communicate with classmates and instructors. While many online programs let students log in and do coursework at any time, some may require online group chats or video conferences at specific times. Students may also have to complete a residency during their program. This typically entails going to the program’s physical campus to take a few hands-on classes, so students who are unable to travel to campus should avoid programs with residency requirements. However, students should expect a certain amount of in-person work. Licensure and certification for mental health counselors requires both supervised and unsupervised clinical experience, so it’s common for mental health counseling degree programs to have internships or practicums built into their curricula. For these, students typically gain hands-on experience at a mental health counseling facility approved by the school. Very few mental health counseling degrees are offered at the baccalaureate level; instead, students typically pursue their education at the master’s level and beyond. Below are some various degree options students can check out to see what suits their educational and professional needs. Prospective mental health counseling master’s students can choose from a few different online degree program options. The Master of Arts, Master of Science, and Master of Education programs all have slightly different focuses, to suit varying interests and needs. A Master of Science in mental health counseling is a good option for students who wish to do psychological research as part of their careers. For example, prospective MS students may have a bachelor’s degree in psychology and want to further their studies through a mental health counseling program. Students can expect to gain knowledge in multicultural issues, ethics, and research skills and theories, along with hands-on experience through practicums or internships. A master’s thesis may also be required. An online Master of Arts program in mental health counseling is similar, but designed for students of all academic backgrounds. Students may or may not have an interest in becoming licensed practitioners. Core classes may focus less on psychological research, but MA students still can expect to learn many of the same things as MS students – social justice, clinical practice, diagnosis and human development – and may also have to complete a master’s thesis. Master of Education programs are targeted to those who want to become licensed mental health practitioners. While MEd programs are founded on research-based content, students are less likely to engage in research projects and more likely to focus on hands-on, professional experience. These programs may suit students who wish to practice mental health counseling in an educational institution. A thesis or portfolio may be required for graduation. Doctoral degrees are for students who want to leverage their master’s degree in mental health counseling or a related field into an advanced professional education. Since doctoral programs are generally designed for practicing mental health counselors, admission often requires that students are hold state licensure. Online students whose doctoral program is outside their resident state should check to see if they need to be eligible for licensure in the program’s state as well. Students can pursue either a PhD (Doctor of Philosophy) or an EdD (Doctor of Education) in mental health counseling. Those who are interested in scholarly, research-based pursuits may be better suited to the former route, typically undertaken by students who want to go into academia. Those who want to enhance their real-world professional skills, perhaps to take on leadership roles within a mental health organization, may be more interested in EdD programs. An education specialist degree in mental health counseling is a good option for those who wish to build on a master’s degree without jumping into a doctoral program. EdS degrees are a midway point between master’s and doctoral degrees, allowing students to gain practical, in-depth knowledge in a specialized area. Unlike doctorates, education specialist degrees usually do not require students to complete a dissertation. EdS degrees are typically terminal, and not designed to segue into a doctorate program. However, if students decide to pursue doctoral degrees later on, some of their EdS classes may transfer. Online mental health counseling EdS programs usually require between 30 and 60 credit hours, so completion time can vary greatly. Online post-master’s certificates can augment a student’s education in a couple of different ways. Some PMC programs provide training in a mental health specialization, helping practicing mental health counselors stand out to potential employers and clients. Often these types of certificates require that students be eligible for licensure before applying to the program. Other PMC programs aim to make students eligible for licensure. Many states require licensure applicants to complete a 60-credit hour master’s degree program in mental health counseling; those who have graduated from a program with fewer required credits can pursue a post-master’s certificate to get the extra credits needed to apply for licensure. Since PMC programs are typically comprised of 12-15 units, students can usually earn their certificates in about a year. Students examine human diversity and cultural issues, especially as they relate to mental health counseling. They learn about social and cultural forces that impact individuals and how to address these issues with clients. The course addresses potential moral conflicts or tensions that mental health counselors commonly face, looking at the legal and ethical consequences of their decisions and reviewing ethical standards developed by various counseling organizations. Students hone their knowledge of mental health research methods, including quantitative and qualitative methods of gathering data, and use of statistics for analysis. This course focuses on mental health needs during various life stages. Students will learn about the stages of human development and how they factor into diagnosis and treatment. Students gain hands-on mental health counseling experience, often in a clinical environment. They complete both supervised and unsupervised hours to help meet licensure requirements. Determine which degree level suits your purposes, and make sure the school offers it at a time that works with your schedule. If becoming a licensed counselor is your goal, make sure the academic program meets state licensure requirements. Make sure you meet academic prerequisites, such as a minimum GPA, as well as any professional requirements, like a specified number of clinical hours or years of professional experience. Ensure that the school and program are accredited. Visit target schools, speak with admissions representatives, and seek opinions from current or former students in the program to gain a first-hand perspective. Be aware of any in-person internship or practicum requirements, and be sure you can meet them. See what kinds of support services, like career placement or tech support, the school offers to online students. Check out the school’s financial aid options and see whether you qualify for them. Be sure you can afford the program’s tuition and fees. While an optional process, accreditation is particularly important in mental health counseling programs. Students must attend accredited institutions to qualify for federal financial aid, and enrollment in many post-master’s degree programs requires a master’s degree from an accredited institution. Furthermore, the National Board for Certified Counselors states that graduates looking to become National Certified Counselors need to have earned their master’s degrees from accredited institutions. Accreditation for mental health counseling programs is usually provided by the Council for Accreditation of Counseling and Related Educational Programs (CACREP), while institutional accreditation is conferred by one of six regional accrediting bodies. Prospective students can learn more about accreditation with this comprehensive accreditation guide, or can check out our main counseling degree page to get information on accredited counseling degree programs. Preparing for an online master’s degree in mental health counseling can be daunting, but being mindful of important tasks and deadlines can help students start their degree program smoothly. Making a checklist is a useful way to make sure all application deadlines and requirements are met. Below is an example schedule for a prospective mental health counseling master’s student. Get acquainted with the types of people you hope to work with by volunteering at a relevant organization, like a foster home or elder care facility. Join a professional organization that focuses on your area of interest, especially if you plan on specializing in a certain aspect of mental health counseling. Even if it’s not your major, take a psychology class or two during your undergraduate years. Research organizations that you can approach when it comes time to do a required internship. Many schools have established partnerships with local organizations, but distance learners may have to put in extra effort to find an internship nearby. Mental health counseling degrees can lead to a variety of careers, both in mental health and in related counseling fields. Most careers involve relating to people to help them cope with problems affecting their mental health, but the specific types of aid, areas of specialization, and work settings have a wide range. Job prospects for mental health counselors are very good, with a projected increase of 20 percent between 2014 and 2024. People who earn an online degree in mental health counseling but choose a related career field, like social work, psychology or substance abuse counseling, will likely find favorable markets as well. In order to become a practicing mental health counselor, graduates of online mental health counseling degree programs must be licensed by the state in which they practice. Additional certifications are optional; they may help prospective mental health counselors gain licensure, and are also a good way for counselors to stand out to employers and clients. Most counseling certifications and licensing examinations are provided by the National Board for Certified Counselors (NBCC). Licensure requirements for professional mental health counselors vary by state, but all follow some basic regulations. Those applying for licensure must have a master’s degree, counseling experience, and a passing score on either the National Counselor Examination for Licensure and Certification (NCE) or the National Clinical Mental Health Counseling Examination (NCMHCE). Students should check with their state board to determine specific requirements. Also, students attending programs in states outside the one in which they live should see whether their program will qualify them for licensure in their home state. National Certified Counselor (NCC) – This respected and widely sought certification, offered by the NBCC, is not a license to practice; however, NCC certification is transferable from state to state and may help in the licensure process. Certified Clinical Mental Health Counselor (CCMHC) – This is a specialized credential offered through the NBCC to mental health counselors who practice in clinical settings. The exam required for CCMHC certification is also required by some states for licensure. Diplomate and Clinical Mental Health Specialist – The American Mental Health Counselors Association offers this advanced credential to mental health counselors who have made substantial professional achievements. It requires that applicants be licensed and have significant professional experience, including training and experience in a specialized area of mental health. Students who specifically want to help people work through their various addictions—such as drugs, alcohol, gambling or eating disorders—might consider pursuing an online addiction counseling degree. Those who know want to help students have successful school careers, from elementary through college, are prime candidates for online school counseling degrees. Christian counseling may be a good route for those who are motivated by faith and want to help others through faith-based teachings and experiences.